Orson Hyde Eggleston was born October 3, 1841 in Niles, Cayuga Co. New York. He was born four months after his parents, Samuel and Lurania Powers Burgess Eggleston, were baptized into the Church of Jesus Christ of Latter-day Saints. He was named after Orson Hyde, whom his parents had apparently met in 1832 when he came to the area as a missionary for the Church of Jesus Christ of Latter-day Saints. In July 1842, when Orson was less than a year old, his father Samuel moved the family to Nauvoo, Illinois. Orson would have spent his early childhood in the growing town of Nauvoo. In early 1846, the Saints were driven from Nauvoo and the Eggleston family left in the spring. They went to Winter Quarters where another son, Samuel was born and died in August 1847. Orson indicated in a handwritten biography that “my father not having means to come west with the Pioneers moved back across the Missouri River to Iowa, lived for a time at Traders Point, then went to Council Bluffs and lived for a time, then went 7 miles north to Crescent City.” The family remained in this area until 1862. Orson would have received his schooling there. He apparently learned the printers trade in Pottawattamie County, along with his brother Reuben. The 1860 Census listed Orson H., age 18, as printer. Orson was baptized into the Church of Jesus Christ of Latter-day Saints December 30, 1860 at the age of 19. He indicated that in the winter of 1860-61 his parents renewed their covenants by baptism and he was also baptized at that time. He was also ordained an Elder that winter, as was his brother Reuben. By this time, Church leaders in Utah had discontinued the handcart companies as an inexpensive means to transport the large numbers of Saints immigrating from Europe. There was then a good supply of wagons and teams in the Salt Lake Valley and the railroad had moved further west, making it possible for teamsters to leave Salt Lake in the early spring, travel to the outfitting point where the railroad ended and bring the Saints to the Salt Lake Valley before winter set in. Orson being a young, single and likely healthy man, was called to assist with this work. 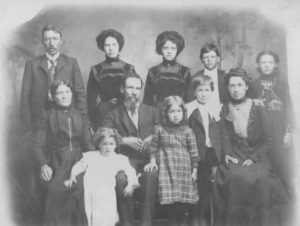 It appears that Orson returned to Utah with his family in the summer of 1862 and returned with them in the James Wareham Company. The Deseret News of September 16, 1862 included a Report on the immigration. “The day was warm in G. S. L. City. Elder Amasa M. Lyman & Charles C. Rich & Co. arrived in Salt Lake City. Capt. James Wareham’s Independent Co. members—Samuel, Lurania, Orson H. & Mary E. Eggleston; Edwin, Eliza R. Charlotte & John F. Eggleston”. Records indicate that Orson made a third trip in 1864 with the John R. Murdock Company. Orson and his family settled in Ogden, Utah. Weber County land records show that Orson owned one acre of land, Lot six of Block 27 Plat A, Ogden City. Orson and Reuben were ordained Seventies in the 53rd Quorum the winter after they arrived in Ogden. Orson apparently became an involved member of the community. The Deseret News of July 4, 1863 included a detailed account of the festivities in Ogden for the holiday. The day began with a flag ceremony at dawn, followed by the band parading through town. Then a breakfast was served at the home of Richard Ballantyne at 7 a.m. A large parade followed at 9:00. The 10th of 16 entries in this parade was described as “12 young men under the direction of Mr. Orson Eggleston.” Following the parade there were speeches and music. On November 18, 1865 Orson was elected Captain in the Nauvoo Legion in the Weber Military District, Company C Infantry, 2nd Battalion, 1st Regiment 1st Brigade. He received a commission from Gov. Charles Durkee. The Nauvoo Legion was the local Militia. It was named after the Militia of Nauvoo headed by Joseph Smith. Because the Saints were isolated in Utah without any military to defend them, in fact the U.S. military being in the position of enemy for some time, the Nauvoo Legion was established to provide protection and defense. A Deseret News article of August 13, 1869 included a report from Ogden including an account of the re-organization of the Weber County Militia, first Regiment, first Brigade. Listed as a Captain was Orson Eggleston. In 1868 T. B. H. Stenhouse began publishing a newspaper in Ogden and Orson and his brother Reuben were hired as compositors. This paper only lasted until October 1869, but by December 1869, a number of enterprising townspeople had organized the Ogden Junction Publishing Co. The first semi-weekly Ogden Junction was published January 1, 1870. Orson and Reuben Eggleston were among the first compositors employed on the paper. The editor of this paper was Franklin D. Richards and Charles W. Penrose was associate editor. On December 4, 1864 Orson married Constant Ann Stephens, the daughter of John Stephens and Elizabeth Briggs. 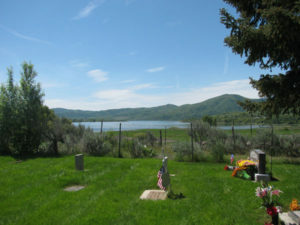 The family settled in Weber County where her father built the first reservoir in 1856. At the time of their marriage Orson was 24 and Constant was almost 16. They were the parents of 11 children. Orson served a mission for the Church to Michigan in 1876-77, leaving his wife home with five children. Orson kept a journal of this mission, which is currently in the Archives of the History Department of the Church of Jesus Christ of Latter-day Saints. He was called on the mission October 7, 1876 at General Conference. It was common for mission calls to be made from the pulpit at General Conference. He was one of 36 missionaries called on Missions to the United States at that Conference. Orson stated in his journal, “I was called by the General Conference to go on a mission to the United States.” Though the mission was to the United States, he served mainly in Michigan. Perhaps he had some choice in that. He had many relatives in Michigan with whom he was able to visit, teach and obtain genealogical information. Orson was blessed and set apart for this mission by Elder Orson Pratt October 21, 1876 in the Historians office in Salt Lake City. He did not have a great deal of time to prepare for this mission. 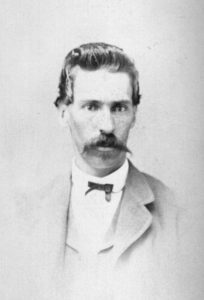 He left Ogden November 15, 1876 with an Elder Porter and headed toward Chicago, stopping first in Council Bluffs. Orson visited with his brother Edwin who was living there. He also visited “A host of friends all of whom seemed glad to see me.” Having grown up mostly in the Council Bluffs area, Orson would have had many friends and acquaintances still there. After leaving Council Bluffs they stopped at Missouri Valley 24 miles north of Council Bluffs where they spent the night with some of his wife Constant’s cousins. They were members of the Church and he indicated they “had a good time taught them the Gospel and encouraged them in the latter-day work which they had already embraced.” From there they continued to Iowa, stopping at Marshall and then traveling north to Parkersburg, where Orson visited his Uncle Ambrose Eggleston. Ambrose was a Baptist minister, so they probably had some interesting conversations regarding religion. Orson did not have much success as far as convert baptisms, however he did visit family members and gathered a great deal of genealogical information. He sent this information home in letters to his father. On July 11, 1879 Orson married a second wife, Mariett Orinda Farley, the daughter of Winthrop Farley and Angeline Calkin. Mariett was born August 17, 1855 after her family had migrated to Utah. At the time of this marriage, Orson was 37, Constant was 30 and Mariett was 24. Orson and Mariett had nine children. February 10, 1881 Orson married a third wife, Annie Christine Johnson, the 17 year old daughter of Danish immigrants, Peter and Anna Maria Madsen Johnson who lived near his home in Eden. Annie Christine was born November 7, 1864 in Salt Lake City. Orson and Annie Christine had five children. Upon moving to Eden, Orson purchased the home of Richard Ballantyne, who had been the first Presiding Elder in Eden. Elder Ballantyne moved to Ogden at that time. 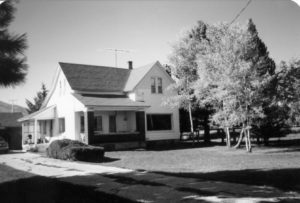 This house still stands in Eden across the street from the Eden Park. Though remodeled over the years, it was reported to still have a pioneer root cellar in 1977. Eden was one of three small towns in Ogden Valley. This rather isolated valley was used as a pioneer herding ground in the 1850’s. A few cabins were built by the herders, but the first permanent settlers didn’t arrive until 1859. Travel into the Valley was very difficult until a road was built through Ogden Canyon. The valley had previously been a camping area for the Shoshone Indians and they continued to camp there in the early years. The L.D.S. residents of Eden were originally a branch under the direction of Captain Jefferson Hunt of Huntsville. They were known as the North Fork District of the Hunstville Ward of the Weber Stake. Richard Ballantyne was the first Branch President from 1865-1874. Josiah Marsh Ferrin was the second Branch President from 1874-1877 with Henry Holmes and Peter Johnson as counselors. The Eden Ward was formed June 10, 1877, around the time that Orson moved there. Josiah Ferrin was first Bishop, with Peter Johnson and Enoch Burns as Counselors. Orson served as Sunday School Superintendent after moving to Eden. He was also listed as YMMIA Superintendent. 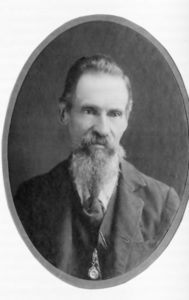 Orson was ordained a High Priest March 3, 1878 by Bishop Josiah Ferrin and was called as second counselor in the Bishopric at that time, replacing Enoch Burns who had moved to southeastern Utah. Orson served in this Bishopric with first counselor Peter Johnson, whose daughter Annie Christine he later married. In January 1879, after the death of Peter Johnson, Orson was made first counselor. After this Bishopric was released November 1, 1883, Orson was made Ward Clerk. He served in that position for several years. Orson seems to have enjoyed living in Eden. In addition to church service, he was the postmaster for several years. Orson’s wife Constance was made first Counselor in the Relief Society June 7, 1878. Orson, as Counselor in the Bishopric conducted the meeting when this took place. Constance served in this position until June 17, 1886 when she moved to Star Valley. Mariett Eggleston was called as treasurer of the Primary June 24, 1881. Orson lost two children, Samuel Lee and John Stephens in October 1878 during a Diphtheria epidemic. They were probably buried in the Ogden City Cemetery. Orson had bought a plot there, where there are two infants in unmarked graves. His parents Samuel and Lurania were also buried in this plot. The people of Eden, feeling the need of a Cemetery there, assembled a committee in 1882 to pursue acquiring some property from Orson Eggleston for a Cemetery. This was part of his farm, sitting on a hill which now overlooks the north arm of the Pineview Reservoir. 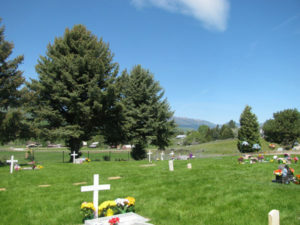 It is now known as the Eden Meadow View Cemetery. November 30, 1882 the committee appointed to see to the grave yard reported their success in purchasing the land for the same and what it would cost to fence it in by itself.” Orson and his family moved to Star Valley shortly after this was all settled, so the only member of his family buried there was his son Joseph who returned to Eden to live. Orson’s father-in-law, Peter Johnson and family were buried there. After the Edmunds anti-Polygamy Act was passed in 1882, life became more difficult for families practicing polygamy. No specific incidents have been reported regarding Orson when he lived in Eden, but he may have felt less safe after this time. The government of Wyoming, in attempting to encourage settlers to that territory, did not seem as concerned about the practice of polygamy. They appeared to see Mormon settlers as hard working, stable citizens. Theywere not very cooperative with authorities attempting to enforce polygamy laws. These factors probably influenced Orson to move his family to Star Valley, Wyoming. In November 1885, Orson went with J. C. Stephens to Star Valley. This was probably his wife Constant’s brother John Cornelius Stephens, as Orson also referred to him as Corniel. Orson left two of his wives with new babies and the other wife expecting and was separated from them for over six months. Orson kept a journal during this time which provides some interesting insights into this experience. It took a week to travel to Star Valley. They stopped in Montpelier to visit Jeff Stephens, a relative of his wife Constant. Jeff accompanied them into the valley. On this journey they got stuck in mud and were rescued by three men who came along. Orson related that they later administered to a sick horse, which did recover. They arrived in the valley November 10, 1885. In his journal, Orson referred to their destination as the Salt River Valley. Star Valley actually consists of two small valleys, united by a narrow pass. Along the side of the valley is the Salt River mountain range. The Salt River, which is one of the Snake River’s largest tributaries, runs from the southeast end of the valley northward through both valleys. 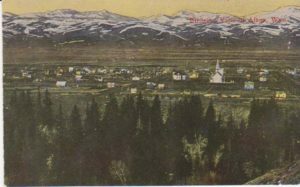 In the summer of 1880, Moses Thatcher, who had been sent by Brigham Young to find areas for settlement of Latter-day Saints in Wyoming, named the valley “Star Valley”. Upon arriving in the Valley, Orson and his companions visited Bro. Charles C. Cazier, who had been made the Presiding Elder of the few Saints in the valley. When a Ward was organized in Afton in 1887, Brother Cazier was the first Bishop. Orson spent the winter of 1885-86 living in a tent. He was involved in surveying the town of Afton and making plans for a meetinghouse, as well as staking out a land claim for himself. Charles Cazier had been instructed to survey a townsite containing 30 blocks, each of 10 acres. This survey was done using a common carpenter’s square and rope. The townsite was later professionally re-surveyed, finding the original survey off only a few feet. Orson obtained a Homestead Land Grant from the Federal Government. It was issued April 29, 1893. It consisted of three pieces of land totaling 160 acres. One was the Southeast quarter of the southeast quarter of Section 15 in Township 32 North Range 119 West North of the 6th Principal Meridian in the State of Wyoming, County of Lincoln. The second was the East half of the Northeast quarter of Section 22 in Township 32 North Range 119 West North of 6th Principal Meridian in Lincoln County, Wyoming. The third for the northeast quarter of the southeast quarter of section 22 in Township 32 North Range 119 West North of 6th Principal meridian Lincoln County. An early Map of the town of Afton in A History of Star Valley, showed that Orson lived on Sixth Avenue, east of Adams Street. Emil Vaterlaus started a newspaper in Afton in 1901 called The Star Valley Pioneer. In 1902 The Pioneer was published on Fridays and publishers were Emil Vaterlaus and his brother Conrad. December 12, 1902 Conrad S. Vaterlaus took over as editor and publisher. The name of the paper was changed to The Star Valley Independent on September 9, 1903. Conrad Vaterlaus continued as editor until sometime around September 1907. Henry H. Billings was listed as editor in a paper dated September 13, 1907. He operated the paper with O. H. Eggleston as typesetter until 1913. Apparently the Vaterlaus brothers recruited Orson to work with them on this paper because of his previous experience in the business. 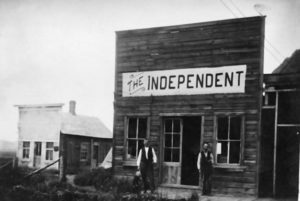 This photograph shows the building with a sign “The Independent” and two men standing in front. On back of the photograph they are identified as Conrad Vaterlaus editor and Orson Eggleston, Compositor. Typesetting was still done by hand on this paper, which would have been a very tedious job. With Orson’s previous experience however, he was probably very proficient at it. The Afton Ward was organized in 1887 with Charles Cazier as first Bishop. Orson served as Sunday School Superintendent and clerk of the High Priests Quorum. His wife Anne Christine served as the Secretary of the Relief Society. 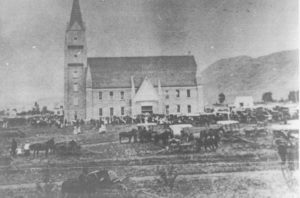 The Star Valley Stake was organized in August 1892. Orson served as a member of the High Council. A Tabernacle was begun in 1904 and dedicated August 15, 1909. This was a rather impressive structure built of sandstone, of middle English design with a large tower 140 feet tall. Almost everyone in the valley assisted in some way in the building of this Tabernacle, so most likely Orson and his family contributed financially, with labor on the actual building or in fund raising projects. Orson practiced dentistry in Afton and his first wife Constant assisted the sick and delivered about 500 babies in the valley. 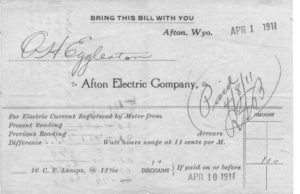 Apparently by the early 1900’s electricity had come to Afton as shown by Orson’s 1911 electric bill. Orson did practice polygamy freely in Afton. Eventually he had separate houses for his wives. The 1900 Census of Afton listed the family in three households. Orson was head of one household, 58 years old with wife Merry E. [Mariett] age 44 and children. Annie C. Johnson was the head of the next household at age 35 with three children. The next household was Constant Eggleston as head age 51, with two adult and one teenage son. There was a place in Star Valley called Signal Hill which served as a lookout. It was visible from all parts of the valley and the entire valley could be seen from it. From there smoke from a signal fire warned settlers of approaching strangers and especially federal authorities looking for polygamists. This would have given them time to hide. Another signal was given if the approaching people turned out to be harmless and it was again safe. Orson was arrested at least one time for practicing polygamy, though he was not convicted. 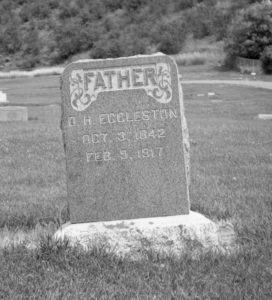 Records for the Fourth District Court, at Ogden July 30, 1892, indicated that the cases of several men charged with polygamy, adultery, and u.c., including Orson Eggleston, were dismissed . U.S. Marshall Eli H. Parsons, made the motion to dismiss because it was impossible to secure evidence sufficient to justify a conviction. This would have been during the time he lived in Afton. Orson’s first wife Constance eventually divorced him and remarried. Third wife Christine died before Orson, so at his death he had only one wife, Mariett. Orson died February 9, 1917 in Afton, Wyoming and was buried in the Afton Cemetery. Milton R. Hunter, Beneath Ben Lomond’s Peak, A History of Weber County 1824-1900, Daughters of Utah Pioneers, Salt Lake City, Publishers Press, 1966. Esshom, Frank, Pioneers and Prominent Men of Utah: comprising photographs, genealogies, biographies (Salt Lake City, UT: Utah Pioneers Book, 1913) (979.2 D3) p. 550, 856. Tripp, Bartlett, 1839-1911, Journal 1861 David H. Canon Company (Church Emigration Book Vol. 3) Church History Department Archives, Church of Jesus Christ of Latter-day Saints. Biography of Orson Hyde Eggleston written for the Genealogical Society of Utah, p. 130-133. Photocopy in possession of the author. Eggleston, Orson Hyde 1841–Reminiscences and Diary, 1876 Nov-1877 Jan., Church History Department Archives, Church of Jesus Christ of Latter-day Saints, photocopy in possession of the author. listed in Davis Bitton, Guide to Mormon Diaries and Autobiographies, Provo, Utah: BYU Press c. 1977, p. 98. This entry was posted in Biographies and tagged Eggleston, Illinois, New York, Utah, Wyoming. Bookmark the permalink.